Reach & Match Inclusive Learning Workshop in Singapore! 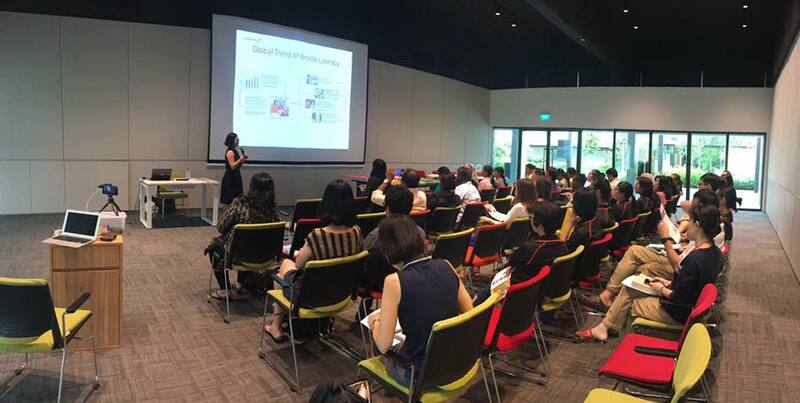 We were so excited to bring the first Reach & Match Inclusive Learning Workshop in Singapore! We sent out the invitation only one month before the workshops, so thrilled that we received over a hundred registration from teachers and practitioners from different schools and organisations joining us. We have even added an extra workshop due to the amazing responses. We were really thankful to have Enabling Village to host our workshops. Thanks so much Enabling Village for sponsoring us these beautiful venues, space and facilities are very nice! Enabling Village is built to support the integration and inclusion of able-bodied and disabled persons in Singapore. Besides an information and career centre, they are also home to several social businesses that provide training as well as retail for people with disabilities. We are so grateful to receive support from our friend Dr. Wong Meng Ee, who is the Associate Professor teaches courses in special education in Singapore, he has attended our presentation and also had a play with Reach & Match. It was wonderful to meet him and we had a great catch up to discuss the disabiltiy and inclusion in Australia and Singapore. We have an amazing turnout and have a great time with the group of teachers and specialists that are passionate about inclusion! Many educational therapists and teachers joining us and their proactive and engaging attitude are impressive! We have had a wonderful time to meet people from various of institutions and organisations including AWWA, Lighthouse School, MINDS, Cerebral Palsy Alliance Singapore, Katong School, Presbyterian Community Service, Dyslexia Association of Singapore, and more.